I hosted a baby shower for my dear friend Lisa. She has two darling boys and found out this baby is a girl. I was so excited for her I thought I'd invite a few of her friends over to celebrate the occasion. We had an open house at lunch time so women could come and go as their schedules allowed. We enjoyed lunch, a dessert bar and drinks. She got the cutest outfits and headbands for her daughter. This baby will be a fashion plate. I'm excited for her big day on May 11! Pink and green cake bites. Strawberry marshmallows dipped in caramel and chocolate. Vanilla cupcakes and chocolate buttercream frosting. With a pink safety pin. Pink Gerber daisies in water with green decorative rocks. 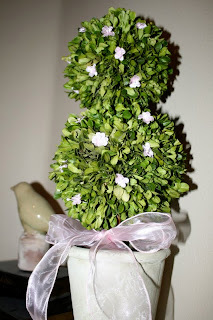 I decorated my boxwood trees with pink flowers and ribbons. Porcelain (?) animals with party hats thanking guests for coming. Remind me to tell you how I "created" the animals above. Cloth napkins with a pink pacifier napkin ring. I had everyone write their name and address on an envelope for the new mommy so she could send out thank you notes with ease. Raspberry Lemonade with fresh raspberries and lemons. Fresh fruit and amazing dip. Dessert bar. I tried to stay with the pink and green theme. Each guest could fill a bag with treats to take home and enjoy later. Drink station with raspberry lemonade and water with cucumbers and basil. Pretend you see caprice skewers on the table too. They didn't make it for the photo. 2 Response to "Baby Shower"
The caterers I've used in the past couldn't have done it better..... beautiful! Please show us how you made the animals and the cupcake trays.